Questions for NOAA and NPS Death Valley that have gone unanswered related to the 100 year celebration of the 'hottest ever temperature' | Watts Up With That? Those sort of temperatures might make this a viable power generation scheme. As Ace would say, the answer to all of your questions is “eff U., That’s why.” Same answer you get from the government to any other questions. Actually I might like to fit a diffusor at the top of that. A hot jet of air like that replacing natural chaotic processes may have unexpected consequences! You are a skeptic and therefore do not deserve any type of answer from us. You will please to keep your mouth shut or we will send Moose and Rocco to pay you a visit. Or place a heat protected projectile in it, let the chimney fill with cold air and have the slowest , longest, low pressure launch tube you could likely get. Areo-static launch velocity and length/temp figures anyone? Yes I was really just cross posting from there anyway. Now I am to trying to use this to get to sapce :-). For the record: I resent the email again this morning, and got “out of office” replies from both, so I know the emails are getting to their inboxes. I got no such replies Tuesday when I originally sent the email. Ah yes, the happy sound of crickets. The temperatures around the world are going down slowly but . . oh look over there, a squirrel. People who collect and process data often don’t like to answer questions on their results. . . Especially if the quality of the data isn’t that great. I once asked why someone used a 2hz low pass filter on strain data. I knew that’s what they did because the data was not only absolutely gorgeous and centered around 0 but also the FFT analysis fell off a cliff below 2hz. “What high pass filter?” Is the response. . . Damn your pesky, interfering questions, we have a tourism campaign to deal with right here, right now don’t ya know. LOL. I have to say Anthony, thank god for honest intelligent peoples like yourself who do all the hard graft in checking the fact and calling these liars to task. I believe there is some sort of madness stalking the western world where well to do people seemingly have to find reasons to hate their own countries that primarily being the USA the UK , Israel and some parts of Europe not forgetting Australia where these very same people are rampant at the moment. Yes these people are driven so much by this mixture of guilt and self loathing that they, even as scientist and whatever constitutes a scientist nowadays that they will torture the data anyway the can to achieve their ideologically driven needed evidence. If this goes on and twice you’ve emailed them now; it not only shows an ignorance and contempt for the truth but also shows that when people like you shine a spotlight on them and ask absolutely pertinent question they all seem to have run and hidden and THAT says a lot. I know you don’t like getting too political Anthony and would rather skip that stuff and just patiently put the facts out there but you are dealing very much so with a politically motivated almost spoilt juvenile mind set where truth and integrity are sacrificed at the drop of a hat if it helps create a lie that suit political ends. Sorry to rant but I really get fed up with it and this isn’t only manifested in the sceptic v warmists . Anyhow everyone all the best lets hope a great summer an snowy winter even though it is disruptive, See even I’m doing it. I will be surprised if you receive satisfactory answers. Out of office emails are a great source for spammers. I try to not use them as much as possible. The latest in solar power launch systems. As you sit in your capsule floating in the bath of soon to be made steam water below you check the seals to the launch tube around the capsule are tight. The solar power collectors are just about up to launch temperature now and soon it is time to go. The launch tube above has been pumped down to the air pressure at the top of the tube now and we are into the count down. The valves below open and all the stored solar energy and hot air vaporises the water almost instantly so you start to rise. The accceration is gentle but persistent. We got the figures right today and as we leave the top of the tube we are right on target for orbital insertion. Eko low Earth orbit? Depends on the tube length and the temps I suspect. They resent it this morning again too! They have been getti g away with their climate fear mongering for so long, they now feel whatever they satisfy correct. Time to clean house, demote some, fire others. A wake up call is needed. They should acknowledge the email questions with an estimated response time at the very least. Then again, maybe the questions are just too difficult. The answers to some of these question are freely available on the web, if Anthony Watts chose to actually do some research. The Furnace Creek and Greenland Ranch sites are VERY closely located. I found the latitude and longitude of both online within about 5 minutes of searching for them, they only differed by 1′ of latitude (same longitude) and 2 m of elevation. Watts is complaining because someone else is too slow or too busy to do research that Watts is too lazy to do. REPLY: And, are you too lazy to provide the link to that lat/lon info you found? Or was there some other reason you did not provide a citation to go with your complaint? The recent photo of the 128deg reading shows that the reading was taken from an angle, causing parallax error between the thermometer markings and the mercury in the middle and thereby making the reading look higher than it really was. 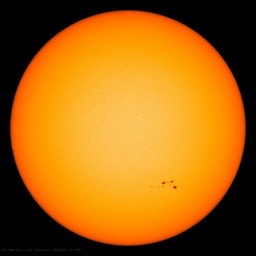 (i) The extreme heat that recently developed in SW USA […] is caused by jet stream changes and shifts driven by predictable solar activity effects. (v) We request media to publicize our free forecast with acknowledgement […] to help preparedness and reduce suffering and death. Evidently that also works for thermometers. It would be interesting to know if the shelter in 1913 had a fresh paint job or not and why the observation of 134 was so different from surrounding locations. Anthony – bless you for fighting the good fight with all your might. Well, this http://journals.ametsoc.org/doi/pdf/10.1175/BAMS-84-12-1725 (PDF) seems to have the lat / long data you seek. It also has a nice discussion on the various weather stations on site. We are in receipt of your letter dated July 3rd 2103. When the National Oceanic and Atmospheric Administration issues a press release, you can be assured that the facts are accurate and the claims have been thoroughly vetted by the some of the world’s leading climate scientists — many of whom shared the 2007 Nobel Piece Prize with former Vice President Al Gore. The debate is now over. We have no intention of entertaining questions that might confuse the public. As a licensed member of the independent press, you must take care not to publish inaccurate, misleading, or distorted information. Should you print deviations from the facts presented in the press release without our consent, you could be deemed by our department to be disseminating inaccurate, misleading or distorted information. Such conduct could result in a subpena of your phone records along with an audit by the Internal Revenue Service, the US Fish and Wildlife Service, the Occupational Safety and Health and Administration and other federal agencies as deemed appropriate by us. I trust that this letter has cleared up any confusion that you might have had. Has anyone seen this study about UHI in Phoenix? This is to counter USA Today’s ill-informed, opinionated writer Brad Bannon with the usual hyperbole, Chicken Little, knee-jerk responses. I guess Brad Bannon never took a science class or understood that melting of SEA ice won’t raise ocean levels. Antarctica ice is a different story since it’s on land and not bobbing up and down on sea water. I hope they respond. From my experience the Park Service has been amazing and honest and I’ve found their papers very useful in defending my skeptic perspective. Of most use was the paper on Portage Glacier studying moraines. It showed that in 1913 to 1915 PG melted 900 ft in 3 years, making Q? glacier’s 900 ft in 25 years seem slow. 1913 is how many years before the suv? Also, a paper that an ancient forest is appearing beneath Exit Glacier C.D. to 400 years ago (meaning it was warmer and for long enough that a spruce forest grew and matured where there is nothing but ice now). If they were corrupt there is no way these papers would be available. Here is the NPS paper, only it was Exit glacier that retreated 900 ft in 3 years and not Portage. Just finished this paper, does answer some of Anthony’s questions on location of temperature readings and sitting. Interesting that the picture of the site in 1926 shows a Stevenson screen only 1.1 meter (1924 report) above the ground. Is there data on whether this is thee same screen as used in 1913? When looking through the tables on max temperatures lots of years had readings similar to what has been reported so far this year. What evidence of forest, under a glacier !! How do trees grow under a glacier.. I mean, Mickey Mann says its warmer now than its ever been. So the trees must have grown under the glacier. Right ?? “Jim” is yet another pseudonymous troll, perhaps one of the nest of paid vipers whose misbehavior on this site, patiently indulged by Anthony and his moderators, provides such a valuable insight into the intellectual and financial corruption that now infects the scientific, academic, media, enviro, and political communities on the “global warming” question. Anthony cannot by any stretch of the most over-funded troll’s bought-and-paid-for “imagination” be described as “lazy”. Latitude: 36.27 N. (not clear whether this is 27/100 or 27/60). Longitude: 116.52 W. (not clear whether this is 52/100 or 52/60). Weatherbase.com does not show Greenland Ranch as a weather station, but lists Greenland Ranch, CO, as a location that has no weather station. However, the ten Weatherbase-reported stations nearest to Greenland Ranch (5-14 miles distant) are listed. None is Furnace Creek. 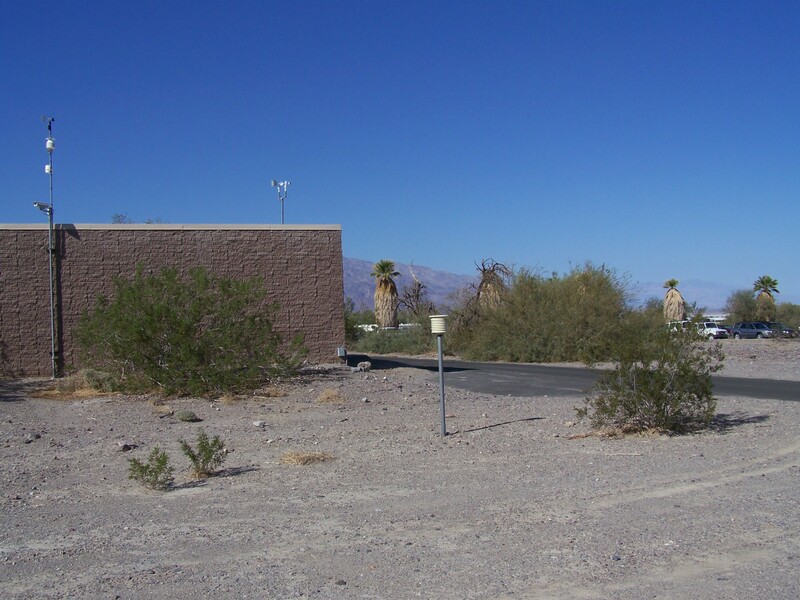 Station ident 043603 (note that these digits were reversed to 306340 in the Weatherbase.com unique resource locator for Furnace Creek). Elevation -51 meters (multiplied by 3.28 feet gives –167 ft 3 in). Latitude 36 degrees 27 minutes North. Longitude 116 degrees 52 minutes West. JISAO does not list a “Furnace Creek” weather station at all. 1. On the basis of the station idents having the same six digits, one a palindrome of the other, one might infer that the two stations may be identical. 2. However, the two stations appear to be in different states, suggesting that they may not be identical. 3. If one assumes that “.27” and “.54” are sixtieths and not hundredths, the latitude and longitude of the two stations are identical to two places of decimals, from which one might infer that the two stations may be identical. 4. However, the two stations are separated by some 23 feet in altitude, suggesting that they may not be identical. 5. The troll says the two stations are separated by some 2 feet in altitude, suggesting that one or other or both of the two stations whose details I found may not be the same stations as the troll found. 6. The troll also says the two stations are separated by 1 minute of latitude, whereas the two stations as I found them have latitudes identical to the nearest minute. Given these uncertainties, which seem typical of the general sloppiness in temperature recording in the U.S. (one trembles to think how much worse it is likely to be just about everywhere else in the world), Anthony was surely justified in asking, in a polite and straightforward way, for the locations of the two stations. Anthony. You are to be extremely grateful for all of the information provided to you by the Ministry of Truth. The data released to the public have been checked by professional experts for completeness and accuracy. There is nothing more you need to know and we are not authorized to disclose further details. The very words ‘Visitor Centre’ give you the agenda behind all this publicity. I think we can all take a good guess at the answers Mr Watts would receive if he were granted the courtesy. Well, My first thought as i read your letter was — party pooper. i have greatly enjoyed our national parks and each strives to have a “billboard item” connected to its name. Death Valley has had some setbacks — one being, some years back, when “a big fat slob” wanted to have his picture taken sitting on top of “mushroom rock” and broke it. The bitterness still runs deep in Death Valley over that incident. And the loss of “World’s Hottest Place” to Libya? Death Valley has been plotting ever since to get that title back. Do you think it coincidence that the Libya claim is refuted just in time for Death Valley to celebrate its hundredth year as the hottest place on earth? 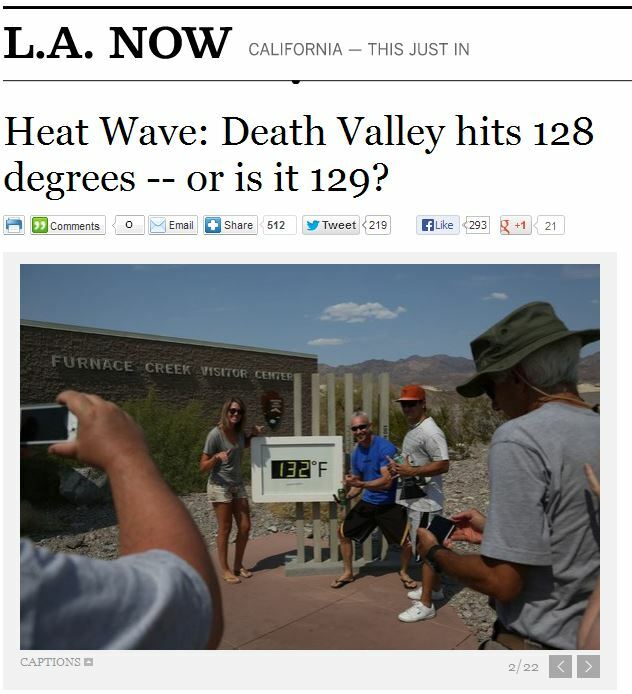 Yes, indeed, there is a ‘warmest cabal” operating in Death Valley. Admittedly, this “cabal” does not want to be questioned closely about its operations — but they are striving to promote “Death Valley Warming — not global warming. They can’t help it if the results of their plotting are used by a much larger, much more sinister group for truly nefarious purposes. I must confess that I fail to understand how this is good publicity for the Team/cause/warmists. Assuming that the temperature set in 1913 is not exceeded by the time of this press conference later this month, surely the take home point that any reader/viewer of the news bulletin will be left with is that the warmest day was long ago, and that there has been no significant warming these past 100 years. Any publicity that promotes the fact that the warmest day was long ago, just emphasises how over hyped the scare is that the planet is warming out of control. I suspect that public asssumes that the record for the warmest day, the wettest day in each and every state, and each and every country are recent events. I suspect that they do not appreciate that nearly all extreme records happened long ago just emphasising that there is nothing exception about the present period in which we live in. i considered Anthony’s questions reasonable and Lord Monckton’s comment illuminating. Obviously, NOAA can clarify these uncertainties. Whether they will rests to be seen, but I would not hold my breath. I think that water addition is a poor choice. Although it has greater capactity to absort heat there are much simpler and more effective efficiencies to be made I believe. Firstly let us describe what we are seeking (or so I believe). We are dealing with a low grade energy source (solar) which we need to collect as much of and use it as well as possible. The less energy interfaces there are (such as moving to water/steam etc.) with their consequent potential losses the better. So the ideal engine is one that operates on air and solar only. It should have a multi-stage layout with rising temperatures as we go though each stage towards the exhuast. The volume, velocity and pressure will remaim unchanged throughout the engine. Only temperature changes as we move through it. The first, pre-heat stage, is a flat black metal plate of relative thinness. Below it is an air cavity and it has insulated side and bottom. Air flows in at one end. The plate is angled so that it points at where the sun will be at noon on an equinox and runs directly West – East. The second, heat stage, is another flat plane, this time covered by an insulating sheet of high heat glass placed a few meters/centimeters above the plate. The same insulated sides and base continue and it too points at the exquinox. The third, or super-heat stage, is another flat box, this time standing vertically. There are cylindrical ‘mirrors’ concentrating the available sun light onto both sides of this, now fully metal, vertical box. At all times the volume and cross section of the various stages have remained the same and they are all connected in sequence with constant cross section areas. This allows us to ‘fix’ pressure, volumn and velocity as unchanged throughout the engine. The ‘chimney’ at the center does not have to be that tall now. We are dealing with air that will be in the 200+C hopefully and the hydro-static ballance we require is pivoting round the turbine now anyway. The air can expand out to loose the temperature and the work can be extracted by a fan or turbine in the resultant air stream in doing so. The exhaust velocity/temperature is controlled by how much air needs to move to from hot to cold to allow the required work to be done. The important thing here is the cross section remains constant, except where we expand it out to get the energy. 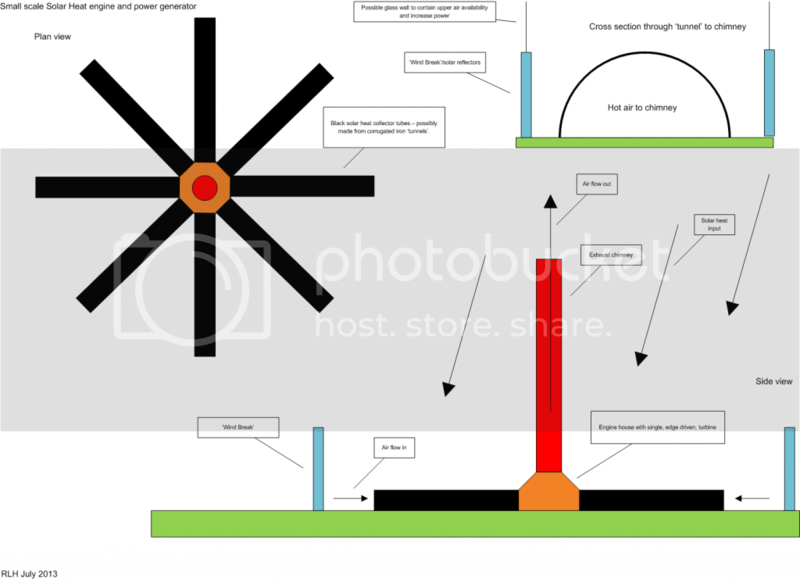 The addition of a forth, ‘hyper-heat’ section, with a ceramic tube at the center of a even larger cylindrical solar collector to allow even higher air temperatures will require a higher temperature turbine also. `Low tech version (which could just be single ‘burner’/stack) could be built with local materials if an edge driven fan is used instead of a turbine. Think of a lorry axle mounted vertically supporting a large horizontal fan and blades at the top. Generator takoff from where the prop shaft was. Wheel on the ground bolted to the floor. The fan can be as large as required and made out of local materials if the heat is kept low and larger air volumes used instead. Flywheel capabilty can still be included (see below) to allow for night time working even at small scale. Ultra large scale, storage added, versions would require a circular ‘ring’ filled with ballast, floating in a circular water canal and the ring retained by guidewheels to the bank. The top of the ring carries a set of turbine blades which interact with multiple fixed ‘heat towers’ in a similar fashion to a Whittle turbine laid out flat. The only difference is that this engine operates at constant pressure/volume/veloicty and the only variable is temperature. That gives an almost ‘free’ way to stored unneeded energy that is collected. As rotational energy in a very big flywheel. Big enough, who knows, to get through the Winter? Cheap enough and efficient enough you think? Anyone want to do the maths and work out the best cost/benefit/size ratios? From Kilowatt to Gigawatt. And who builds the first prototype? Race anyone? Any first-year statistics student would raise a hand at the idea of an “average Earth temperature”. What, for example, is the standard deviation of the measurements? What’s the range? Where are the collection points? Does the idea really have any meaning? At any given point, it’s a function that can change value by up to +/- 100 deg F over a 24-hour span (in some places), and that much again over a 365-day span. Richard LH: Your “low tech” version is like one used by gardeners or farmers: a tube of rectangular cross-section at the side of a building, the sides of glass or other transparent material, with an opening at the bottom. Sunlight heats the air inside, which rises. They collect the hot air to heat the building, but it could be used to run a small fan-generator. Unfortunately, it generates airflow only during sunny days, The flywheel energy storage seems a bit wanting. Some years back, there were experiments using a high-speed flywheel to power vehicles (their aim was to power buses). Even at 10krpm and greater, and high-tensile fiberglass wheels, the project never took off. If heat’s your first product, that can be stored in materials like Glauber’s salt (Na2SO4·10H2O), but you’d have to find out how efficient that is. Alternatively (and probably more reasonable), batteries could store energy to use overnight. Unfortunately, the take-home point that will be stressed is that it broke the record for JUNE. Indeed, this is a three stage engine based on that old gardening principle. It gains in efficiency because it can reach higher air temperatures. Just what is required in a good heat engine. Energy storage at low speeds/high mass are at the other end to high speed ones. Try stopping a loaded barge in the same canal with your finger. It will work but does take some time! And for a frictionless surface, a half circle floating in a sensibly larger canal and at low speed/high mass makes for a very low friction setup. If you really, really need to do so, then teflon coat the huill surface and go lower. And provided you keep the ‘hull speed’ to about the average local wind speed then you can add ‘sails’ to to ring and do a combined solar/wind power station! A giant horizontal flow air turbine as well. If you want it this way, this is Trevithick (old gardening setup), through Watt (super-heating) to Whittle (jet turbine) in an air engine rather than steam. Just reaplying history to today. A minute of latitude is one nautical mile, so you’re basically drawing us a big circle on the map rather than defining a meaningful locus. It’s at least in the neighborhood of the visitor’s center. I’d need more pictures to vector me in to where it really is. Ok . so final workable design – I hope. Sorry for the Tigger bouncing up and down – Olw is back now. Firstly let us describe what we are seeking (or so I believe). We are dealing with a low grade energy source (solar) which we need to collect as much of and use what we collect as well as possible. The less energy interfaces there are (such as moving to water/steam etc.) with their consequent potential losses the better. Also it must be cheap and easy to construct, locally if possible. So the ideal engine is one that operates on air and solar input only. It should have a multi-stage layout with rising temperatures imparted to the air as we go through each stage towards the power takeoff point and have a low temperature exhaust. The pressure will remain unchanged throughout the engine. Only temperature/velocity changes as we move through it. If you want a simple mental picture of how all this works, think “little lemon pip of air being slowly pressed between two slippery plates and getting faster all the time”. Single Solar Air Jet Pipe. Long thin box open at one end to the outside air, roofed with a black, heat absorbing/conducting panel towards the sun. Bottom and sides of insulating and heat resistent materials and sealed air tight except at the entry point. Angled to the equinox noon sun for year round working and running West – East. Air entering (through an air filter as required?) through the open end of the box starts heating up. It wants to expand. Because of the sealed, constant cross section of the box, it does so by moving faster on down the tube. Towards the exhaust. Another long thin box constructed as above but this time with an insulating ‘glass’ roof to achieve higher temperatures in the air. Same angles to the sun. Same heating/velocity effects on the air. This is now a mechanical thermal diode series pumping power into the air as both heat and hence velocity. The pressure is still constant. Well the ‘pressure/temperature/velocity = constant’ triple point is anyway. Higher air temperatures will mean higher velocities and because this point is higher up the temperature gradient, gives a self starting capability to the engine. Final box section, this time ‘on edge’ and now fully heat conductive. Cylindrical ‘mirrors’ concentrate the required power on each side. Highest air temperatures/velocity and a good top end to the input thermal gradient to get all this going fast in the morning. Cylindrical ‘mirrors’, and hence box rather than tube, rather than parabolic for cost reasons. Can also use a very large ‘flat plane’ mirror array in extreme setups. Now we are cooking. The air is now very hot and, because it is actually ‘pushing’ against the new outside ‘cold’ air now comming in to replace it at the entry point, it is now moving quite quickly. Stage 1 = Trevethic. Old steam. Stage 2 = Watt. Super-heat steam. Stage 3 = Whittle. Jet engine. Concentrator venturi/expander (similar to the compressor stages in the Whittle engine). Takes the now fast, hot air from the prior ‘heat’ stages and then converts some of it’s intertial energy as required to get to an even higher local velocity in the air stream and then reverse itagain and slow it down again to get to the air temps as required by the fan/turbine input. This is probably the high point, thermally, for the engine. Downhill from here. Classic turbine entry throat. We now have very hot fast air, still at the ‘pressure/temperature/velocity = constant’ triple point, at the face of a turbine which is also has its exhaust at the base of a hydro-statically balanced exhaust chimney. Air flow up the chimney is driven by the temperature difference to the outside air from the turbine/fan output face up to the top of the chimney only, in the ideal case. As the chimney/exhaust can be of any width as well as height, so final output velocities and hence temperatures can be kept as low as required to get reliable operation. We can allow the air to expand out (and hence cool it down to the required exhaust temperature) and do work using a full, multi-stage turbine, or get somwhat less energy out by using the simple interia of larger air volumes which are required by an edge driven fan. That should get better results in that setup even though it may give higher exhaust temperatures so higher losses. The height of the chimney now is really governed only by the need to keep sufficient air flow in the exhaust stream, not to extract power as such, so the height required is correspondingly less. Just enough to reliably not choke the turbine output. This is because we have kept to the ‘constant pressure point throughout’ requirement and kept that pinned right through even in the turbine. Even when we expand it out we are doing so at constant pressure to get the highest efficiences. Volume/temperature/velocity are what changes. Not pressure. The overall point is that this is cheap. I mean really, really cheap. And so simple to make. If you have the odd sheet of metal and glass around you can build one in your back garden. Do NOT allow children to get near the hot end! Now we have a working, individual ‘solar heat air jet pipe’ then all the classical multi chamber engines then follow, in whatever scale required. Low tech versions (which could just be single collector/concentrator stack) could be built with local materials if an edge driven fan is used instead of a turbine. Think of a lorry axle mounted vertically supporting a large horizontal fan and blades at the top. Generator takoff from where the prop shaft was. Wheel on the ground bolted to the floor. The fan can be as large as required and made out of local materials if the heat is kept low and larger air volumes used instead. Flywheel capability can still be included (see below) to allow for night time working even at smallest scales I think. The rest below may sound more exotic, even extreme. But I think still possibly plausible. Ultra large scale, or storage added, versions would require a circular ‘ring’ filled with ballast, floating in a circular water canal and the ring retained by guide wheels to the bank. The top of the ring carries a set of turbine blades which interact with multiple fixed ‘heat towers’ in a similar fashion to a Whittle turbine laid out flat. The only difference is that this engine operates at a constant pressure point and the only variables are thus velocity and temperature. That gives an almost ‘free’ way to stored any unneeded energy that is collected. As rotational energy in a very big, slow flywheel. Big enough, who knows, to get through the Winter? Cheap enough and efficient enough you think? Even without the storage? Very basic 1.5 stage engine that started this all off. And for the second project. Should work well here if the winds are high. Wind power for the future. The problem with wind is the air. Its too light in mass really. In order to get useful energy collection we need to think big. And it keeps coming from all directions and so erracticaly. So let’s start with a big flat field somewhere where the winds blow constantly enough to make this all worth while. Or a nice round hilltop which we can work with. Draw a big circle on the ground out to the limits of the property and give it a little ‘working’ space round the outside or somewhere down from the top of the round hill. Dig a circular canal inside the planning circle of whatever dimensions you wish. Make it a half circle in cross section. Construct a boat ‘ring’ that is suitably smaller to give needed clearancies and float inside the canal. To fill up the whole canal area. Load with as much ballast as required to bring it down to just a half cirle below the waterline. Place some sleepers round both inside and outside of the cannal and construct two rings of quide rails inside and outside the canal. Add wheels to the ‘ring’ to centre it in the canal. Add whatever friction reducing compounds you want to ‘hull’ and water. Cover to protect against frost, evaporation, accidents, etc. We now have a nice big, high mass, low speed, low friction bearing and flywheel to work with. Now to get it all moving. On the ‘ring’ add some fixed wing blades to whatever vertical dimensions local planning will allow you to get away with. Construct them so that this is running in the low speed, high torgue end of airfoils. Space round the ring as required to get the best overall air flow. Remove the protective covers on the blades and wait. Looked at from above, you now have a large vertical cross flow air turbine. At very low cost and speed. Slowly building to the local average wind speed if you don’t take power. Will run for as long as there is wind to collect. Virtually zero maintenance and running costs. More complicated solutions will require computer controlled airfoils or ‘faster than the wind’ propellors driving the ‘ring’ onwards. Only for those who require the last word in efficiencies. P.S. The above should be ‘bird friendly’ as well. Wave power for the future. Waves are big things. Lots of mass. Really lots of energy. Difficult things and they can get VERY big. Look at a cross section of a single wave though. It has a peak and a trough. If we can take all of the water than is in the peak and drop it into the following trough we will have recovered all of the energy of the wave. All bar turbulence anyway. So let’s create a mechanical diode circuit that can do just that. Construct a large flat ‘beach’ and make it float at ‘sea level’. As wide as you can sensibly build. Point at the waves. Add to ‘beach’, banks, in the form of an flat entry throat towards the turbines at the ‘back’. Drop the water through the distance of the RMS average height of waves collected, half above, half below, ‘sea level’ in some large horizontal water turbines. Take the outflow and return it to where the waves are collected as a slow ‘DC’ return to where the waves are breaking across the whole beach. A mechanical rectifier for waves. Build as large as required. Moor where needed. It is also possible to add the same large ‘flywheel slow storage concept’ to this as well to create energy harvestor ships that can collect far distance waves. Or build comunities in the oceans.